This property is directly associated with a crucial period (1950-1966) during which downtown commercial redevelopment began to occur after nearly thirty years of stagnation as several major modern municipal government and commercial buildings were constructed. However, compared with massive post-war suburban real estate development, relatively few new buildings were constructed in downtown Seattle until the late 1950s. Major modern construction included the Public Safety Building (1951, destroyed), Seattle Public Library (1956-59, destroyed) and the Municipal Building (1959-61, destroyed), as well as the expansions of the two major downtown department stores. Scattered major commercial construction included several notable extant buildings that reflect modern zoning changes and architectural trends including: the Norton Building (1958); the Logan Building (1959); the Washington Building (1960) and the IBM Building (1961-64). The Seattle World’s Fair - Century 21 Exposition was held in 1962 and triggered the remodeling of older buildings and the construction of the monorail, and tourist-oriented restaurants and motels. Throughout this era older buildings were demolished to make way for surface parking lots and garages and for interstate freeway construction. 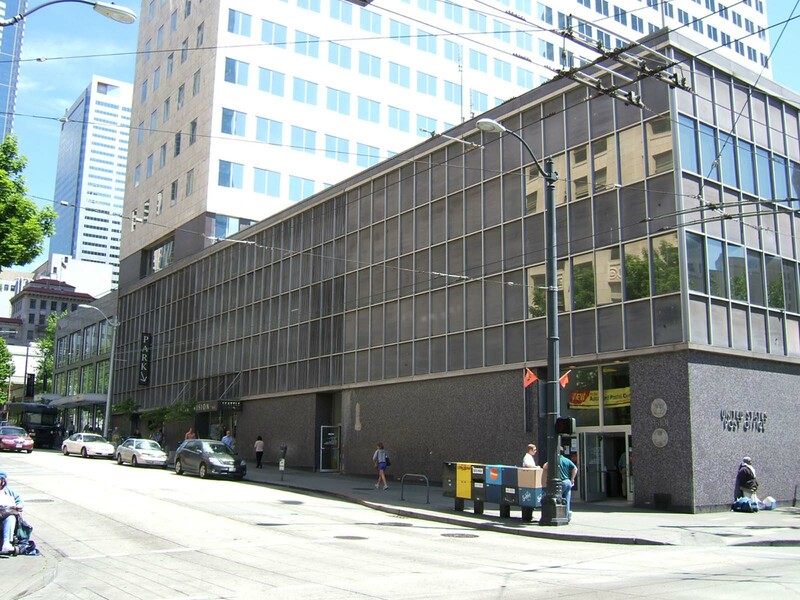 The downtown USPS Seattle Post Office was designed by the Seattle architecture firm Naramore, Bain, Brady, and Johanson (NBBJ) in 1958-59. William James Bain, Sr. (1896-1985) began his architectural education in 1915 as an apprentice for W.R.B. Wilcox, Arthur Lovelace and other Seattle architects. After serving in France during WWI he enrolled at the University of Pennsylvania and obtained an architecture degree. He returned to Seattle where his practiced for himself and in several partnerships with others – including Lionel Pries – primarily designing residences, apartment and sorority houses. From 1941 to 1943, he worked with J. Lister Holmes and others on Yesler Terrace, an innovative low-income housing project. In 1943, he joined with architects Floyd Naramore, Clifton Brady and Perry Johanson to form Naramore, Bain, Brady & Johanson in order to handle several large government projects during WWII. Now known as NBBJ, the partnership went on to design a wide variety of commercial, industrial and institutional buildings for which they have an earned considerable local, national, and even international prominence and attention. The three-story post office building was a complete departure from earlier post office designs. It was executed in modest modern International style with curtain wall exterior treatment and emphasis on function and form rather than exterior embellishments. NBBJ was the leading local architecture firm during this era and were responsible for the design of the new Federal Reserve Bank of San Francisco (1949) as well as major additions (Washington Athletic Club, Spring Apartment Hotel, Securities Building) and remodeling efforts (YWCA) involving other historic downtown properties. The first United States Post Office to be established in Seattle was located in a log cabin on First Avenue in 1853 and was operated by the city’s first postmaster, Arthur Denny. For nearly 50 years, the Post Office moved from one location to another without a permanent post office building. From 1890 to 1899, the Post Office occupied a building on Columbia Street between Second and Third Avenues, which had been erected immediately after the fire of 1889. The current Post Office building replaced a grand Beaux Arts inspired building that had housed the Post Office since 1908. Constructed 1903 and 1908, this massive sandstone structure, complete with elaborate Corinthian columns, ornate cornice, and monumental entry steps, was the first formal and permanent home of the United States Post Office. Its design and construction were indicative of Seattle’s rapidly expanding populous and geographic size during that era. At the time of its construction, this site was a distance from other civic or government-related buildings still clustered near Yesler Way. The building originally housed other federal offices, including facilities for the United States Federal Court and the Department of Customs. During this era the commercial district was rapidly expanding northward, thus choice of the central downtown location – on a portion of the former University Grounds donated by the University regents - anticipated the future expanded commercial core. However, soon after its completion the building was found to be too small; thus, the federal courts and customs offices were moved elsewhere and the Post Office took over the entire building. The original plan for the Post Office did not include its grand entry steps. Thus, late in the construction process in 1907, as Third Avenue was regraded four feet, the addition of the steps in order to connect the entrance to the sidewalk below became necessary. These wide steps – projecting into the sidewalk space - became a kind of front porch to the city, serving as an impromptu meeting place and one of the city’s most active and comfortable places to linger. Eventually, the Post Office quarters became too cramped. Another problem was that the Chuckanut sandstone cladding proved to be incredibly porous, and over time absorbed much of the city’s pollution and reportedly caused the building exterior to deteriorate. The demolition of the old post office building and the erection of the current Post Office grew out of a 1957 development plan created by the University of Washington and its major Metropolitan Tract lessee, University Properties Inc. The plan called for the erection of a new 20-story office building near the site of the Post Office. The site of the proposed office building, the land parcel for the Stimson/Douglas Building, was not large enough to build a new building capable of returning a sufficient income per dollar invested. Therefore, the University proposed an exchange for part of the property that the old Post Office building occupied. The University offered to tear down the old post office building and build new, modern facility in its place. In the deal, the government would convey the easterly 105 feet of its site along Union Street as well as 240 feet along Third Avenue to the University. In addition, the University would be granted a perpetual easement of 35 feet from Third Avenue across the southerly remaining portion for driveway purposes. In turn, a new modern Post Office building would then be constructed on the remaining portion of the site. Upon completion of the new post office building, the University would reserve use of the rooftop for parking purposes for a period of 25 years. The project was met with both support from those that thought the old sandstone Post Office building had become an civic eyesore and felt modern facilities were needed, as well as contention from others who did not want to lose such an important part of Seattle’s architectural history. The project began in April of 1958 with the demolition of the former Post Office building and the Stimson/Douglas Building. Clearance of the site took approximately three months and construction of the new Post Office building took about a year. During the demolition and rebuilding period, the Post Office operations took place at scattered locations throughout the city. The new downtown US Post Office was formally opened on July 13, 1959 and completed at a cost of $1 million. The ground floor included modern Post Office amenities such as 24-hour postal box services, a philatelic counter for stamp collectors, as well as the usual stamps, money orders, and parcel post services. It was built to house 180 postal employees and to provide 34,000 square feet of office space and 1,400 postal boxes. Upon completion, it was considered one of the finest buildings in the Northwest, constructed with modern steel and glass materials and maximizing usable office space. The building also incorporated a 500 car garage, in anticipation of construction of the Interstate 5 freeway and other Metropolitan Tract development and the future need for more off-street parking in downtown. The adjacent modern office building located in the Metropolitan Tract and known as the Washington Building was completed in 1960. The IBM Building at the opposite SE corner of the Tract was constructed between 1961 and 1964. The Rainer Bank/Unico Tower, built in 1973-78, was constructed at the center of the Tract and required the demolition of the White-Henry and Stuart buildings. This building is a partly altered example of a unique downtown government property type. It is a modest example of post-war modern architectural design and one of only seven extant downtown buildings dating from this era. It was designed by a prolific local architecture firm, Naramore, Bain, Brady, and Johanson who designed numerous buildings of greater architectural distinction. Located at the SE corner of Third Avenue and Union Street this three-story building was designed and constructed to serve as a post office and mail handling facility, purposes for which it continues to be used. It measures approximately 96’ x 211’ and includes underground/basement level parking. The building is partly interconnected to adjacent properties in the ownership of the University of Washington that were built under separate permits and for other governmental jurisdictions. It exhibits a box-like, two-part commercial block façade composition and mid-century Modern architectural features. The reinforced concrete structure includes curtain wall construction and reinforced concrete floor and roof systems. The base of the building is distinguished by flat monolithic walls clad with small glass mosaic tiles in hues of brown, purple, and grey. These flat planes are only broken by a recessed entry at Union Street and large plate glass windows at Third Avenue. A narrow aluminum band located at the base and cap of the shaft defines the curtain wall, which is a grid of narrow aluminum members with openings infilled by aluminum spandrel panels and fixed windows that wrap the building horizontally and clearly accentuate the two upper floor levels. A narrow coping serves to visually terminate the roofline. Aluminum and glass entry doors with tall transom lights above lead into the public lobby area, which includes a diamond pattern terrazzo floor and aluminum door and window assemblies. A polished granite plaque, located at base at the north face of the NW corner of the building, is inscribed with the construction date “1958” and a narrow band of black granite runs along the entire base at the sidewalk edge. The parking structures immediately adjacent to the east and south side of this building are separate buildings (situated on UW property) and while designed to match this building are not part of the post office building. Architects' Reference File, Special Collections, University of Washington Libraries. "Proposed New Postoffice Building Would Provide Advantages for City" Seattle Times, July 17, 1957. "New Main Post Office Bldg. to Open Monday" Seattle P.I., July 12, 1959.